The U Street Corridor was buzzing with locals, holiday shoppers and a few tourists as I stepped out of the Metro station and into the eclectic neighborhood. The 25-minute ride involved a transfer at L’Enfant Plaza to the Green Line, but my satisfying afternoon excursion was worth the diversion from my usual trips on the Blue or Orange lines. I turned right from the station and walked for a few minutes before I spotted the perfect place to fill up on fried food after a long day of classes. U Street may be home to the famous Ben’s Chili Bowl, and there are Ethiopian restaurants on virtually every block, but Oohh’s & Aahh’s no-frills storefront caught my eye first. The soul food joint is known for its macaroni and cheese, and for good reason: The gooey heap of soft pasta doused in creamy cheese blew my Thanksgiving leftovers out of the water (sorry, Mom). Oohh’s & Aahh’s serves up Southern sides with its lunch special: cabbage, rice with gravy, string beans, candied yams, grits and collard greens. The latter was a tender, emerald addition to my otherwise fried, cheesy plate. My meal – six chewy BBQ-sauced wings and a side of macaroni and cheese – cost $11. I was tempted to add a slice of cornbread for just $1, but I heard it would be worth saving a little room in my stomach for my next stop. 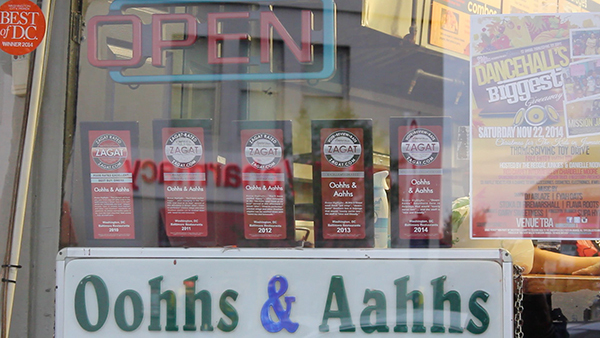 Oohh’s & Aahh’s at 1005 U St. NW serves Southern classics like rice with gravy, collard greens and wings. I headed back down U Street and made a left on 14th Street to check out The Wydown, which opened its permanent location in the summer after a stint as a pop-up coffee shop. A perky barista greeted me with a “How’s it goin’?” before I ordered an Americano ($3) and a biscuit stuffed with sage, bacon and Parmesan ($3). I had to force myself to resist buying a brown butter chocolate chip cookie ($2.20). The Wydown offers pastries with flavors like raspberry rose, apricot rosemary and lavender blackberry, and has strong coffee beans that come from places ranging from Kenya to St. Louis to Costa Rica. The garage door in front of the shop was opened, which allowed the unusually warm December breeze and natural light to make their way inside. The airy bar is decorated with framed, splattered coffee art on the walls and each paper cup is stamped with the Wydown logo. For those looking to hunker down in the roomy shop, take note: The Wydown does not offer free Wi-Fi, so bring a book if you can grab a seat at one of the communal tables. I took my Americano to go, saved my biscuit for later and continued along U Street with the intention of doing some holiday shopping. The cream-colored window panes of the small clothing boutique, Lettie Gooch, hardly stand out, especially compared to the brightly painted storefront of Big Planet Comics across the street, but Lettie Gooch offers original clothing, handbags and colorful jewelry. The boutique sells items by dozens of independent designers, like San Francisco-based Weston Wear, which specializes in glitzy, ultra-feminine party dresses. The selection was all over the place, from kimonos and frilly dresses to utilitarian bomber jackets, so no two items were alike. Prices varied considerably, from $20 tops to $100 jeans, but the sales rack was plentiful, and I ended up purchasing two soft T-shirts for $40. Lettie Gooch is a little pricey, but the next time I have the money for a nice dress or a killer pair of pants, it’ll be my first stop.